Winters call for more time under your duvets, snoozing your alarm every 10 minutes till you literally have to jump out of bed, good filter coffee and of course some warm bakes. Quick, fuss free ones, which support the lethargy get more votes! Thought will tempt you with an easy, cheesy bake for one of these cold winter evenings. Oh, did I tell you that its smooth and silky, with a hint of pepper, garlic and thyme? Quick to put together but uh, you have to wait a bit for it to bake. Good things can't always come so very quick! Sheepishly I would like to present before you another baked custard! Its savory this time around, so there I have the perfect excuse for this one! 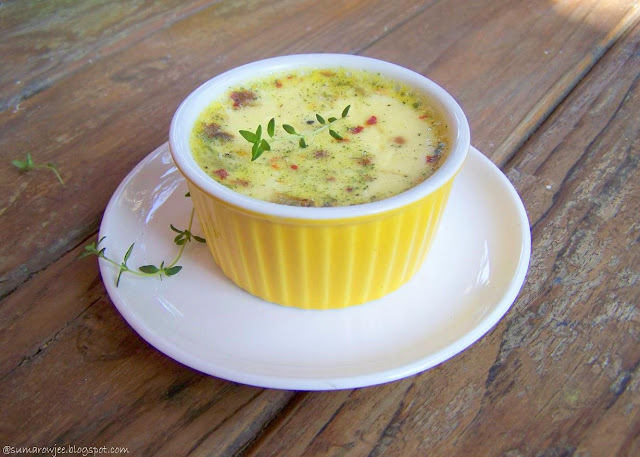 Mark Bittman's savory custard recipe is very basic as he puts it, the variations many. You could make it less or more rich using only milk or only cream or half of both. Throw in some grated cheese and you have a cheesy version. Add some sauteed veggies for some more goodness and for a little bit of texture. Make it rich with cream or half and a half and cheese, you have an appetizer. Richer versions are better served in small portions in ramekins, the less rich versions can be made in a big dish as a nice addition to your meal of bread, soup and salad. I made these savory custards with milk and some low fat cheese, garlic, caramelized onion and yellow peppers. We liked it! The kids licked their ramekins clean (though the son kept insisting that he would like plain cheese and no veggies please! Come to think of it, even I seem to think so - hope my kids don't read this!)! But I so want to try this with sauteed mushrooms and spinach and use this in other bakes as well! As with all baked custards, you only need to learn to temper the eggs (adding the hot liquid very slowly while whisking, so as to get the eggs to a hotter temperature very gradually) and get comfortable baking in a water-bath / bain-marie. Not to forget, gauging when the custard is baked, as over-baking this can make them rubbery and you may miss the smooth velvety-ness. 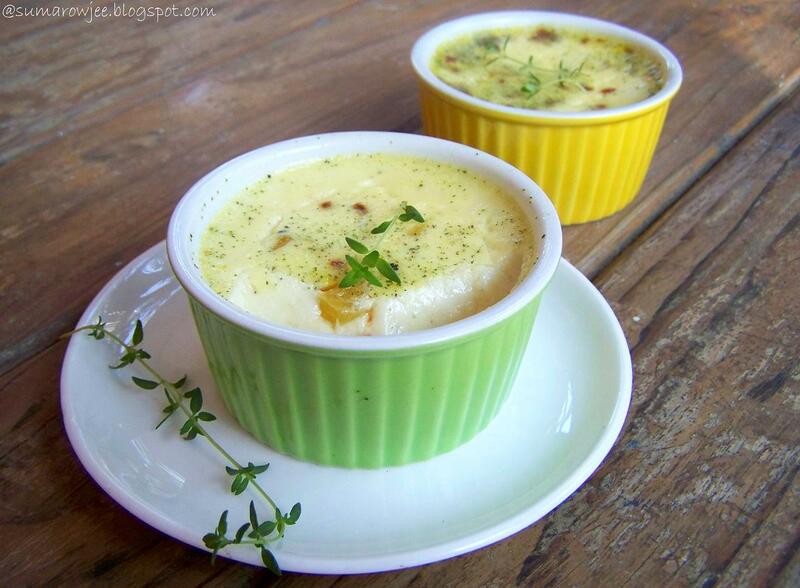 So do not shy away from baking custards, its really easy! Pre-heat oven to 150 degrees C / 350 degrees F. Assemble a medium sized heavy bottomed saucepan with a handle (you should be able to easily pour out the milk from it), another medium sized heatproof bowl of about 3 cups capacity at least, small oven proof bowls (I used capacity ramekins) , a whisk, a spatula, a couple of kitchen towels. Have some water just under boiling point (better more water than less) ready on your stove on simmer, you will be pouring the hot water into the baking tin to surround the ramekins. A baking tin, (I used an 8'' square tin and another smaller tin which I baked in my OTG) Place the ramekins in the baking tin. Have on hand a pair of mittens or thick kitchen towels, to help you lift the tray with the hot water in it. (You are supposed to first place the baking tin the oven and then pour the hot water, but this is not possible in my small oven or even the microwave, the rack may tilt in the process). If using sauteed vegetables or spinach, distribute the sauteed vegetables in all the ramekins equally, the quantity depending on the size of the ramekins. Say about a teaspoon and a half in each one.. Do not add the sauteed vegetables directly to the milk mixture before pouring it in the ramekins as the vegetables will tend to remain at the bottom as you pour. And you will need to huff and puff, get all worked up about the mixture getting cold and re-distribute. Place the eggs, egg yolks, salt, pepper and herbs in the medium sized bowl. Whisk to blend well, no need to whisk to a volume, leave the whisk in the bowl. Heat the milk (or cream or half and half), stir in the cheese, stir to melt completely. Heat till the milk begins to come to a boil. Take about 1/4 cup of the milk-cheese mixture and dribble into the egg mixture while whisking constantly. Be sure to dribble it in very slowly, keep whisking. Do not rush this process. Slowly dribble in the rest of the milk, keep whisking. Pour the egg milk mixture into the ramekins, you can pour up to just below the rim ( doesn't rise in the oven, just sets). Pour the hot water into the baking tin to come halfway to the sides of the ramekins. Open the door of the oven, carefully lift the tray and place it in. Bake the custard in the water bath for about 20-25 minutes (for small ramekins, read note) or until the center appears set, but jiggly when you shake the ramekins). Do not over bake or your custard may turn rubbery. I normally remove the ramekins from the hot water soon after they are baked. Allow them to cool and serve when they are warm, (not hot ) almost at room temperature or at room temperature within a few hours of baking. Keep them wrapped in clingfilm. Baked Roasted Garlic Custard: Add 4-8 cloves of roasted mashed garlic to the egg mixture. Baked Spinach Custards: 1/2 cup of very finely chopped cooked spinach, with the excess water squeezed out. I will try 1/4 cup chopped spinach and 1/4 cup cooked mushrooms, love the combo! Sauteed vegetables - My addition to the basic custard 1/3 cup finely chopped yellow bell peppers, 5-6 cloves of garlic, 1/4 cup finely chopped onions, 1 tablespoon oil . Heat the oil in a pan. Add the chopped garlic, then the onions, add a tiny pinch of sugar and let the onions caramelize. Add the bell peppers at the end of the cooking time, with time just enough time to slightly soften them. Season very lightly with salt (if using cheese it will add to the saltiness), helps draw out excess moisture too. Make sure all the juices have evaporated. Set aside to cool. Do not use too much of sweetish veggies such as white onions or colored capsicum together as your custards will taste sweetish unless you will add enough pepper or cayenne or use roasted tomatoes to balance out the sweetness. Please note: The baking time depends on the size of your ramekins or baking dish. It also depends on whether you use only milk (part skim or whole milk) or cream or half and half, with or without cream. With cream and cheese or either of them, it will set faster. If using cream only, I would not use the cheese or use just a tiny bit of it as a topping before baking or it will taste too rich. If making this rich, its better to bake and serve the custards in small ramekins. If using fresh herbs, you will need to use more, you could heat the milk, drop the herbs in, let the flavor infuse for about half an hour and then re-heat to continue. Yes, fish out the herbs before you use! Again, try these and experiment to see what you like best, if you love baked custards, this will be a great recipe to have on hand! A savoury custard has been on to-do list... just never got round to finding a good recipe.. these look soo good!! saw somebody once serve them with some lamb chops!! Great pics! I'm not an egg-eater, so I will need to adapt these. But they only offer sets of 6 in a few basic colours. The ones you've used are so pretty! 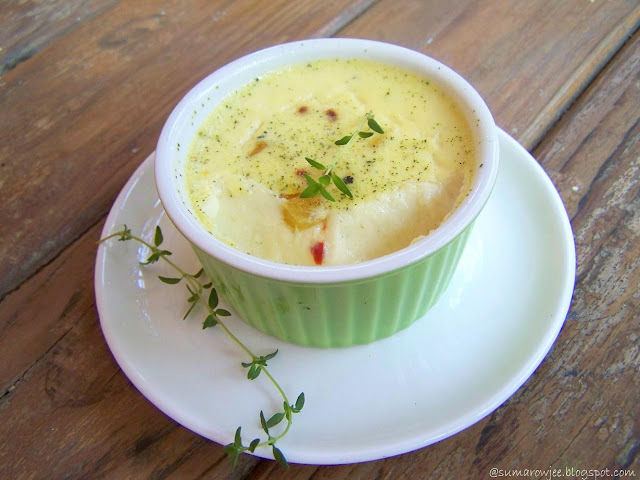 Have not tried baking savory custard...will be baking your version this weekend. Looks creamy and lovely! Looks very very tempting Suma! i have never tasted a savoury custard suma.. :( but this looks so inviting... and i know i have told this before, but the efforts u take with the details... and the variations.. kudos.. u r a savior..
@Manu - I got them from one of the shops in Arihath Plaza, Commercial Street. They were not available last time I went back for more..
Like the idea of a savoury custard. Those ramekins are so pretty ! Hello! My blog name is Miss Margaret Dashwood and I love your blog (and your carrot cake....my sister is egg allergic/anaphylactic)and i have tagged you so check out my blog, An Accomplished Young Lady. hi, can i substitute eggs with corn flour.waiting for your reply. Hi, can i substitute eggs with corn flour? waiting for your reply. love the cute pictures and the ramekins look so cute!!! I love that rustic wooden plank u've got! Envy! 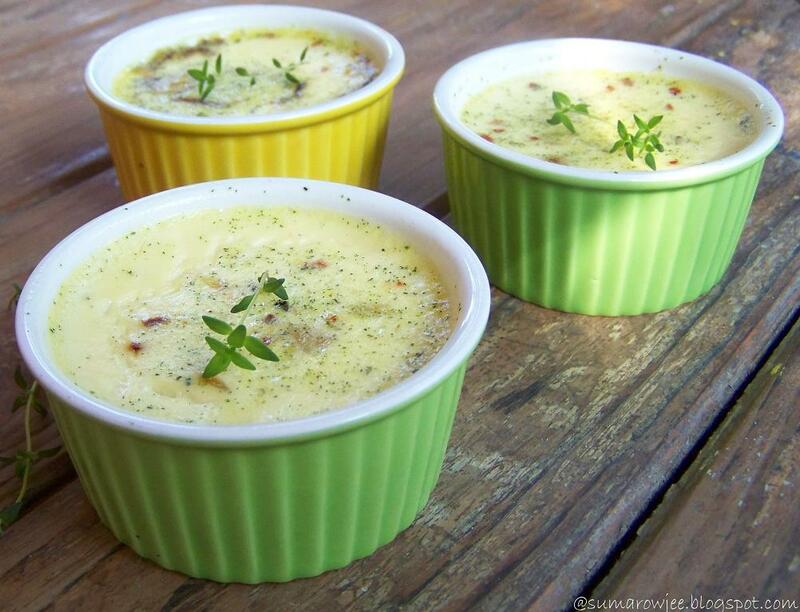 Your Cheesy Baked Custards look delicious.